For medical students driven to perform innovative research, a fellowship can be a dream come true. That dream came true when two University of Miami Miller School of Medicine students, in a first for the school, were selected as Medical Research Fellows by the Howard Hughes Medical Institute. 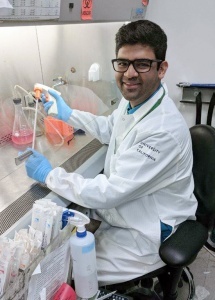 Sumedh Shah working in a tissue culture hood in San Francisco. The students, Angela Zhu and Sumedh Shah, will receive financial support to pursue the research project they proposed in their fellowship applications. They will spend a year away from the University of Miami at a prominent research facility and work alongside a mentor and thought leader in their chosen field. Zhu is working in Boston with Daniel Lee, M.D., a surgeon at the Massachusetts Eye and Ear Infirmary, and Bernardo Sabatini, M.D., Ph.D., a neurobiologist at Harvard Medical School. She hopes to help patients with cochlear implants who struggle to communicate fully and effectively in noisy environments. Her research proposes that advances in optogenetics could improve spatial selectivity of neuron activation in conjunction with electricity. Shah is spending the next year in the lab of Manish Aghi, M.D., Ph.D., a neurosurgeon at the University of California, San Francisco. Shah is taking on a challenge that has vexed oncology researchers for years — why tumor cells in the particularly aggressive brain cancer glioblastoma are able to withstand various cancer treatments. Unlike previous researchers who looked at these cells in isolation, he plans to examine how glioblastoma cells alter and interact with the surrounding microenvironment of the brain, including how they hijack a patient’s immune system to do their bidding. Angela Zhu in the laboratory in Boston. 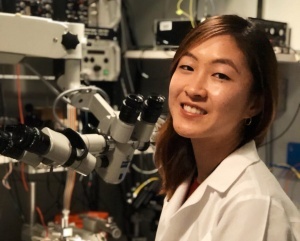 The aim of the Howard Hughes Medical Institute (HHMI) Medical Research Fellowship is to help transform medical students into the next generation of physician-scientists. Shah sees the fellowship as a way to explore and appreciate the interplay of clinical care and basic research. Zhu and Shah both credit Miller School mentors and experiences for their ability to secure the fellowship. For example, Zhu consulted Adrien Eshraghi, M.D., with whom she had done research in the Miller School’s Department of Otolaryngology, for help in choosing an HHMI project mentor. “It was invaluable to hear his input, and for that I am extremely grateful,” she said. Shah’s first exposure to research was at the electron microscopy facility on UM’s Coral Gables campus. He examined brain tumor cells using electron microscopy as part of the UM Brain Tumor Initiative under the supervision of Regina Graham, Ph.D., a research assistant professor in the Department of Neurological Surgery. Shah also received the news via email.